My solution has been inspired by many internet readings, especially the one from AppSatori. Implementation should be 100% Gradle. Could be either run during the build phase or as a post-build step. Should work easily from Jenkins, IntelliJ or from the command line. No passwords should be commited in git (I’m paranoid, I know). 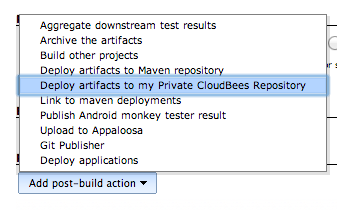 Maven-publish is the new way to deploy Maven artifacts but as Cloudbees uses WebDAV which is not (yet) supported by maven-publish the maven plug-in was the only choice. In order to enable the artifact deployment we need to add some configuration instruction in the build.gradle of the project we want to deploy. I didn’t explicitely defined the artifact id which will defaults to the gradle project name. def cloudbeesPassword = "You'll never find me"
This is working but I don’t like it as it requires to have the password pushed onto the git repository. At this point you have two options: using global passwords defined in Jenkins configuration (Mange Jenkins and then Configure System) or use job defined passwords. I choose the global ones as this enables me to share this configuration between jobs. -DcloudbeesUsername=my.username -DcloudbeesPassword="You'll never find me"
Doing this we have a username/password configuration which no longer needs to be pushed onto the git repository making it possible to change the credentials without touching the source code. Another nice thing is that Jenkins takes care of removing the password in the log pages. At this point you have a working build file and you can use it by adding the uploadArchives task either in the build phase or as a post-build phase and everything should get deployed on your Cloudbees snapshot repository. Of course you’ll also need to add the system property to gradle bridge in this project too. 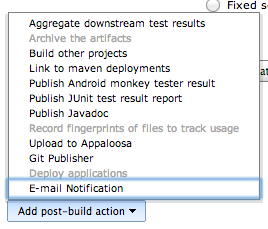 And voilà it works from Jenkins. If you build your project outside of Jenkins it won’t work as the credentials are not injected. The lazy approach would be to manually add -DcloudbeesUsername=my.username -DcloudbeesPassword="You'll never find me" to the command line when running gradle. You’ll also need to tell your IDE to add those options to the build command line too. This will be working but I discover that IntelliJ was adding those options to a configuration file that will be committed to git.So I went for a another solution. 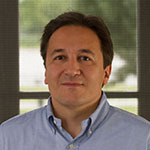 // Set system properties for cloudbees connection. System.properties['cloudbeesPassword'] = "You'll never find me"
Deploying artifacts on Cloudbees with Gradle was published on May 23, 2014 .